Northwestern needed a signature win to offset Saturday’s demoralizing loss against Penn State. Through two halves and nearly four minutes of overtime, it seemed as though Tuesday’s road contest against No. 7 Maryland would provide the Wildcats with just that. From start to finish, the Cats played with a mission. They crashed the offensive boards and hustled on defensive rotations. But when the final buzzer sounded, the Terrapins finished on top, 62-56. And a quick glance at the stat sheet reveals what should have been obvious going in: Maryland was the better team. “When you play Maryland, we’re not going to win a racehorse game with them when they’ve got athlete on athlete and pro on pro,” coach Chris Collins said. The Terrapins shot the ball better, especially out of the gate. By any metric, an NU team with a still-recovering star center in senior Alex Olah, a slumping senior guard in Tre Demps and a collection of shooters who shot 5-of-21 from deep should have been blown out. And yet, they weren’t. Until the final stretch, Collins’ team played with a fire perhaps unseen thus far into the season. It was evident in the way they rebounded as a team on the offensive end, grabbing 16 offensive boards to Maryland’s four. It was evident in the way they moved within their matchup zone on defense. In the end, heart wasn’t enough to overcome an obvious talent disadvantage, amplified tenfold by Olah’s lingering health concerns and Demps’ shooting slump. 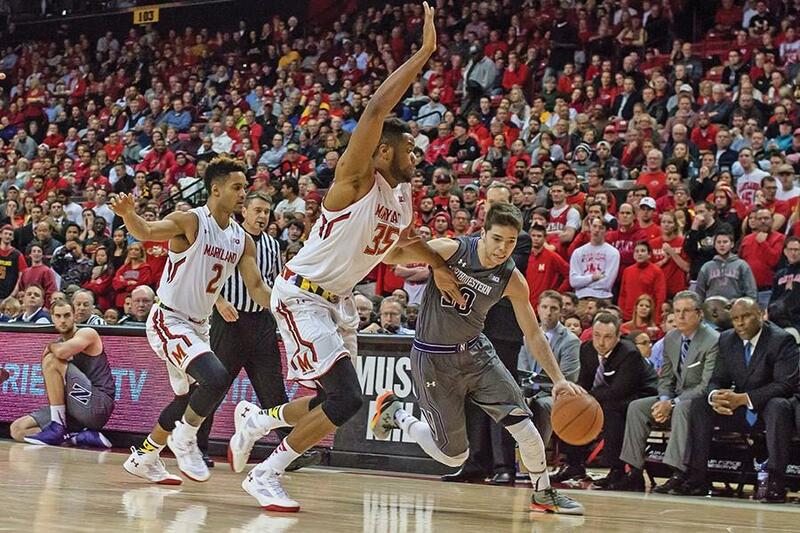 But against Maryland, an outmatched NU squad showed that when talent isn’t enough, they have that extra gear necessary to compete. It was a gear first seen in the Wisconsin win, when the Cats grabbed a much-needed home victory amid concerns that they couldn’t compete on their own turf. Coming out of a Penn State loss that few predicted, the Cats could have rolled over. A bad loss like that, coupled with health issues and a tough upcoming schedule, could doom NU’s tournament chances. But despite a disappointing outcome, Tuesday’s contest showed the Cats know how to respond after a loss.